We live to design and love it. Would you like to be part of the journey? Found something you like but love to tweak the design to add a bit of personal touch? Why, sure! We are happy to work on minor adjustments like font size, ink color and general layout arrangement. Semi Custom allow you to customize 50% of the original design from our collection. You can request amendments like floral color, layout arrangement, font type, wedding monogram, etc. Can’t find anything that you like? Or already have specific design in mind and need our service to bring it to life? We’d love to. Custom design let you have full control on your design and free to customize it 100%. Techniques and tools we use to make the design come to life. Flat printing or digital printing is our most basic printing method using high-end printer and super high quality ink. It is the most economical printing method and thus only requires minimal time to process. Foil stamping allows you to add beautiful details on your design. Comes with selection color of gold, copper, rose gold and silver, this method requires extra working time of 2 – 3 working days. Square or rectangular card is boring? Using a special die cut machine can easily let you have a unique wedding invitation shape. Like foil stamping, this method requires extra working time of 2 – 3 working days. Gold, Rose Gold, Copper or Silver foil stamping is a special technique in printing that transfer the foil on a piece of cardstock paper by heat. It adds a special shiny touch to your design and gives extra umph and luxury to your wedding suite. 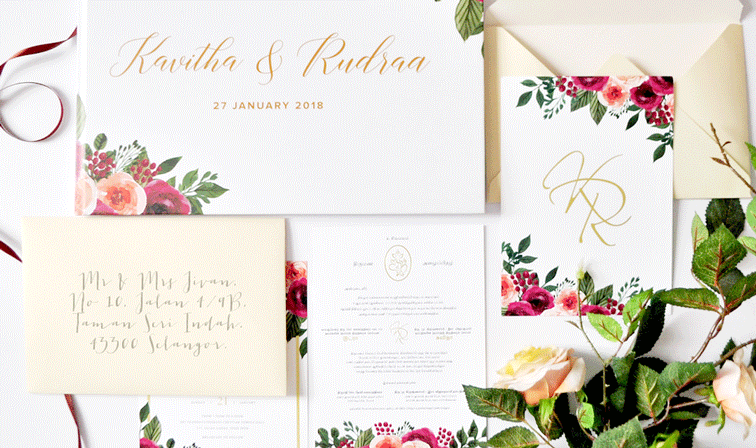 Foil stamping is beautiful on its own or combined with digital printing. However, all beautiful thing comes with their own set of pros and cons. It’s always a great idea to learn about the process before you decide to proceed with it. Pros – beautiful, beautiful and beautiful. There’s nothing else to say because we’re honestly in love. Cons – The process is a bit pricey to compare with flat digital printing. It requires not only the foil but also a metal plate with your design engraved to do the foil transferring. The process is a bit tedious and thus requires special care and longer process. Foil stamping also has its own risk. Because the nature of it process, it is normal to expect a 2mm-3mm misaligned stamping from the original design. To minimize the risk, we’d recommend not to apply the foil stamping on difficult part of your design. Nevertheless, do let us know your idea and we’ll share with you the do’s and don’ts.